Oh, Hollywood! It finds a lot of its inspiration for motion pictures from books. Yet another book adaptation came out on big screen nationwide on March 21, finally putting anxious viewers at ease. You’re right! I am talking about the highly anticipated adaptation of Veronica Roth’s best-selling novel Divergent that everyone was just buzzing about. Thanks to director Neil Burger, the characters of the book came to life, and the viewers plunged into a fantasy world, forgetting the reality for more than two hours. Divergent takes place in the future Chicago. In the film the world is separated by groups called factions based on human virtues: Abnegation (selfless), Erudite (intelligent), Candor (honest), Amity (peaceful), and Dauntless (brave). On an appointed day of every year, all sixteen-year-olds must select the faction to which they will devote the rest of their lives. The main character, Beatrice “Tris” Prior must choose a faction to live in for the rest of her life. What will she choose? Even though Tris chooses the Dauntless faction, she finds out she is Divergent and will never fit into any group. 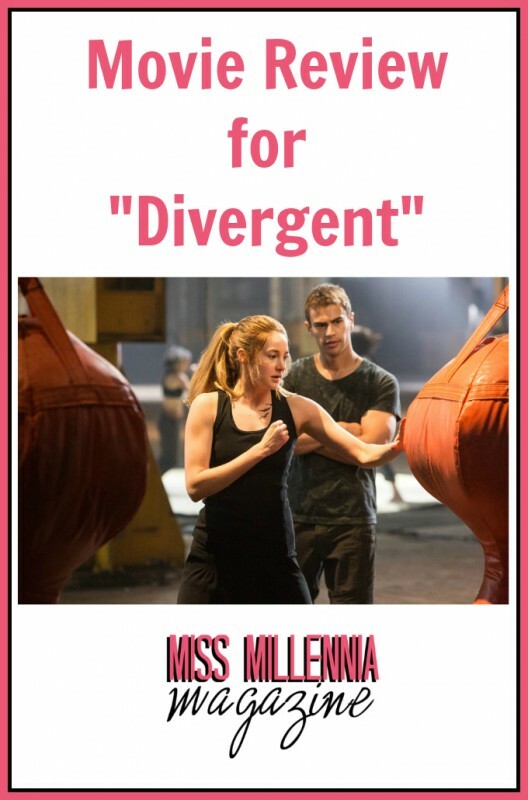 When she discovers a conspiracy by a leader of one of the factions to destroy all Divergents, Tris together with her new-found friend, Four, must find out what makes being Divergent so dangerous before it’s too late. The acting was spot on for stars that are somewhat starting out their acting careers. Shailene Woodley really embodies the spirit of Tris, the young girl who’s trying to make the biggest decision of her life and is thrown some serious complications. Plus, Theo James as Four was just brilliant. He embodied Four and managed to capture the tough exterior of the character, while showing that Four does in fact have a softer side as well. I will say that I was surprised how much of a role Jeanine Matthews, the anti-hero, had in the movie, despite not being so prevalent in the book. That being said, Kate Winslet acted beautifully, and I was absolutely fascinated by her American accent. The cinematography of the movie is also beautiful. The film was shot in Chicago and it was amazing to see how Chicago would look like in the future. But the story delves much deeper than a simple coming-of-age tale. It’s about family and choices and wanting to feel like you belong. Most importantly, it’s about fighting for who you really are. This film is packed with action, romance, and adventure. It has something for everybody. I would say to go check it out, it is definitely worth seeing. And if you’re excited about the film, you can get even more excited, because the author Veronica Roth has gotten an early peek at the movie based on her work. And according to her, it’s awesome!